FREE! When You Buy 10 or More Easy Touch Insulin Syringe 10-Pacs! April Promo! FREE! When You Buy 10 or More Easy Touch Insulin Syringe 10-Pacs! 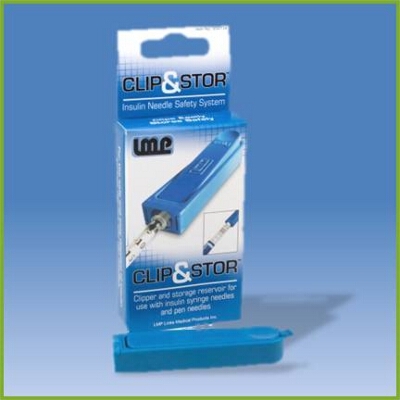 The Clip&Stor™ Clipper & Storage Device removes syringe needles and pen needles safely and easily. A needle clipper is an important item of equipment to dispose of used sharps responsibly, reducing the risk to yourself or others. Simple clipping action snips off and safely retains up to 1,000 clipped needles within clipper. Compact and portable. Locks closed for travel and storage. A "must-have" tool for the HCG dieter or diabetic. Great that this device is included with the HCG Diet Program! Most people probably have no idea how to dispose of their used HCG needles. I replaced my large red sharps container with this handy device. Product is convenient and works great. I appreciate how informative the site is about proper disposal - Big plus! Reviewed by: Alex L. from Colorado Springs, Co.
Blue Velvet Drawstring Storage Pouch 4" x 5"